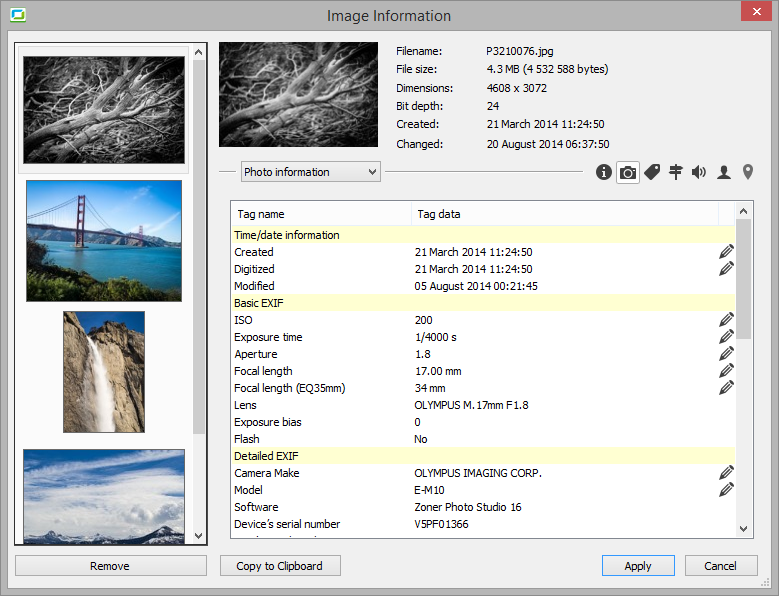 How many software applications do you use in the course of managing your digital images? One to download and view, another to organize, and perhaps a third to retouch? How would you like to replace all of those applications with a single, infinitely superior utility? 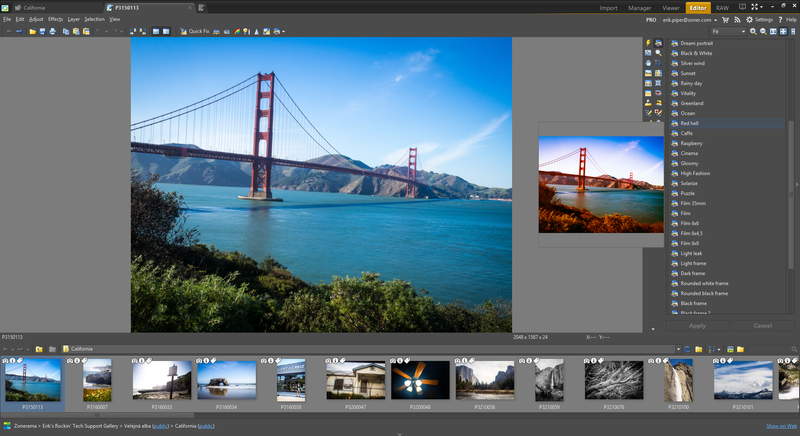 You can with today’s discount software promotion, Zoner Photo Studio 17 PRO! Zoner Photo Studio 17 PRO lets you download, view, rename, organize, retouch, and share your digital photos all within a single application. 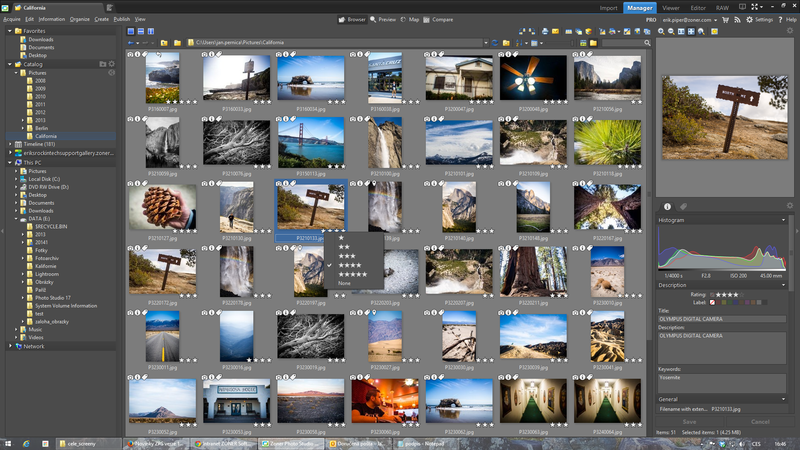 With Zoner Photo Studio 17 PRO, you’ll be able to effectively manage your photos regardless of location, whether it’s on your hard drive, memory card, or tethered camera. Need to retouch an image? 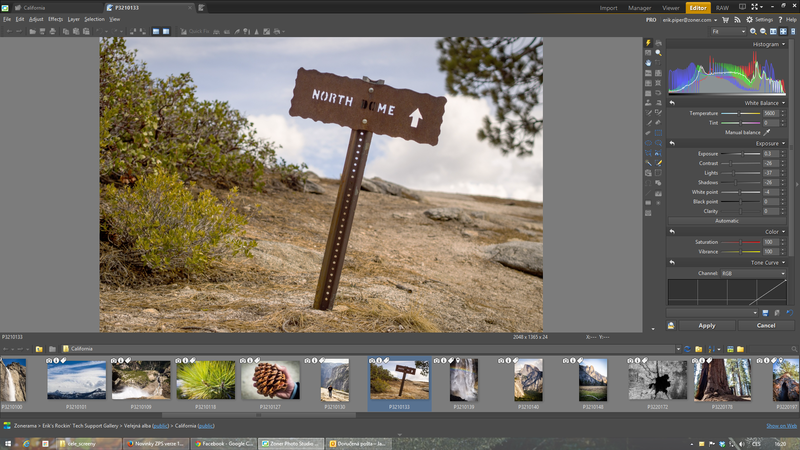 Just use Zoner Photo Studio PRO to load your photos to an Editor that provides you instant insight into Histogram, Exposure, White Balance, Color and Tone Curve. Then play around with a multitude of filters and effects that include tilt shift, HDR, and 3D. Feel free to experiment, as Zoner Photo Studio 17 PRO always makes a backup of your original file! Even if you have a large collection of photos, you can get through them easily thanks to support for Batch Edit. 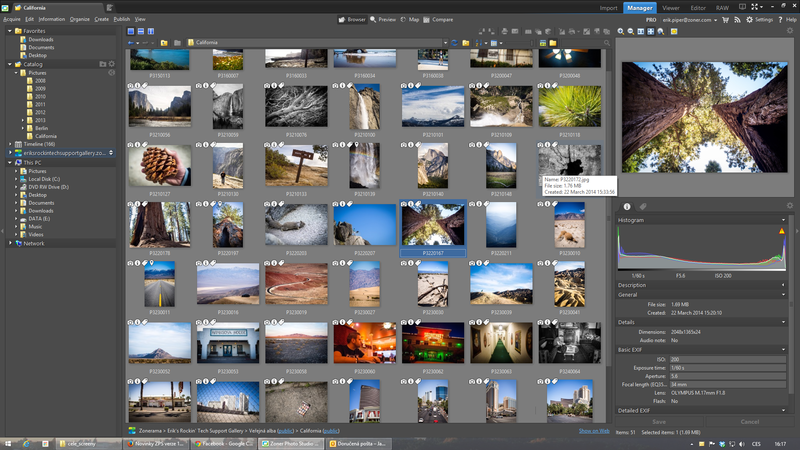 Once you’ve gotten your images exactly how you want them to look, Zoner Photo Studio 17 PRO lets you easily and instantly upload them to Facebook, Picasa, Flickr, and even Zonerama.com. Please note folks: you may click here for the Terms and Conditions which apply to this offer and you may click here for the instructions on How To Install ZPS 17 PRO. Also, version 18 of the product can only run on Windows 7 and higher versions of Windows. 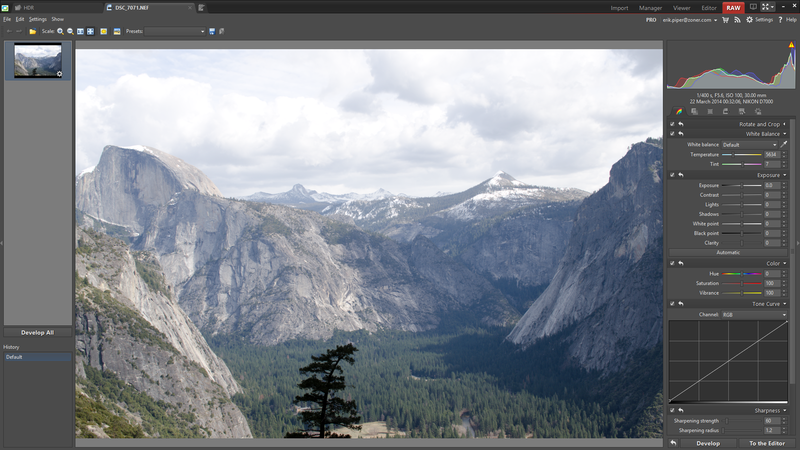 After you purchase Zoner Photo Studio 17 PRO it may be used indefinitely. Zoner Photo Studio 17 PRO is licensed per user, so if more people are going to use Zoner Photo Studio 17 PRO you will need to purchase additional copies. Nelson User is this a trial version only? Sue Long Probably not since they have given away older full Pro versions for years (I have some of them) and since I know that version 18 has just or is just about to come out. Dan Amiel Downloaded the 17 Pro and tried to create an account, but the "continue" button is not active within that process. Zoner support here! Creating a Zoner Account is not necessary for activating this software. We're always happy if you create an account, but you don't need to do so. More importantly, the Zoner Accounts system did have some trouble overnight, so maybe that is what you ran into! If you definitely want to (again - optionally!) create an account, you can try again now, and it will work out. If that doesn't seem to be what you ran into, then I'll have to ask: at what point in the process are you getting blocked? Please be as specific as you can and include as much detail as you can - thanks! EDIT: note that while ZPS 17 does not require an account, ZPS 18 (the paid version) does require one. Dan Amiel Oh i see :-) yeah the continue button was inside the zoner creation account process, not within the software installation sequence, so all good. I haven't installed the software yet, will let you know l8r if all went smoothly. Dan Amiel All went great, thanks again! BitsDuJUser When I tried to install the software, my Antivirus Software. which is a liscenced version of Outpost Internet Security PRO, declares that the install version contains a Trojan Virus called PUA!Agent. There is a Zero chance to install it. Can someone confirm this or have a similar problem? Can the company provide me a direct download link to it? K. Christoph I think, it's only the english version !? Just User Installed Zoner Photo Studio 17 Pro running 64-bit Windows 10 build 14393.10 and activated without a hitch. I've only had a limited amount of time to try it out, but so far, I am very pleased with it. What I am particularly happy about is that the user interface looks and works flawlessly using higher scaling DPI 125% screen setting. Believe it or not, there is still plenty of software out there that may not look correct or even work properly when set to a higher DPI setting. Zoner Photo Studio does looks like it has plenty of features to keep me busy for a while. I can't wait to take more time to explore them more thoroughly. I also found it to quite easy to just pick up and use, very easy navigation. For those that may want a user guide and a few extras, simply head over to https://www.zoner.com/fre...r-download and scroll down to Zoner Photo Studio Extras. Thank you BitsDuJour and ZONER software for this fantastic giveaway today. I am definitely going to be keeping this. BitsDuJUser I tried to download and install it the third time and my anti-virus program blocked it. It gave a message that the install software contains PUA!Agent. Can someone confirm that this is a false positive, or is it actually containing a Trojaner? Neither we nor BitsDuJour places trojans in our software or fails to scan for Trojans, because the negative effect of that would put us (or BdJ) out of business. This is a false positive. You can scan any file for viruses and trojans using a large number of different antivirus programs all at once using, for example, the VirusTotal service (virustotal.com) or other such services. The special BitsDuJour giveaway installer can only be downloaded through BitsDuJour. That is correct - this is the English version. BitsDuJUser Well, it is very much possible that your impression from your side may be correct. However, the antivirus software I use is Outpost Security pro, which is an excellent software. This is not free and it is licensed one. I have also heard that softwares could be changed inbetween the origin and users computer during the transmission. Thats what I now assume. I no longer thought that this is a false positive because I have turned off the heuristic function. Thereafter, it will not make any speculation. It is also possible that the BJD wrapper of your software has something, which my anti-virus software does not recognize it. Regardless of this, I refuse to believe that this is a false positive. It is better to close this chapter for me and accept that I will have to let this offer go rather than making a research on what is wrong somewhere. or is the installer for one-Motherboard only use? Eva Lee Getting fed up! Not receiving any license code!! Inbox, junk mail ...checked em all & NO CODE! Uninstalled,, reinstalled ...nope! This page requires a secure connection which includes server authentication. The Certificate Issuer for this site is untrusted or unknown. Do you wish to proceed? Why is the license untrusted or unknown? It says i need to login from inside the application with a zoner account. created and logged in to your ZONER account. But when i login from inside Photo Studio, it asked me for license code to activate the product. Can I just ignore it? If i don't activate, will this PRO version won't get revoked after a few days? It's my understanding that everyone gets the same download, which is named zps17_en_pro_bdj2-August2016.exe. I also don't think this is a BDJ wrapper installer, as it is digital signed by ZONER software, a.s. on July 28, 2016. At my end, I am running ESET Smart Security and Malwarebytes Anti-Malware Premium fully updated, and neither of them have detected anything. But in the end, it is your decision not to download and install. Did you submit the alert to Yandex, (who purchased Agnitum and are discontinuing it by December 31, 2016) so they can investigate it? No valid licence for this product is connected to this account. Please enter a license code in the window below. Constantin Florea We (BitsDuJour) do not wrap the installers we receive from vendors. We just upload them to our servers with a slightly different name. BitsDuJUser I repeat again: This chapter is ended. I do not care what others think. I do care about my computer getting infected. If I feel something is wrong, then I do not want to install it. Period. That means that I have no confidence on the executable I have downloaded. This could also mean that all others, who downloaded the executable, may not have any malware integrated into it. We know that the American spying agencies have such capabilities and exchange executables during the download. Whats the problem in accepting this? My Outpost Security Pro has given such a warning when I tried to install some software. They actually did have a malware integrated. Now, I got the same message. Thus, I refuse to install the executable, which I have downloaded. If someone here has checked the executable with some software, then they never have checked the executable that I have. Thus, the results in my case and of others may be different. Is this very difficult to understand? Zoner Software Zoner Support here again! @Ian Sample: The installer is not tied to a motherboard. The only special giveaway limitation is that the installer can only be used - i.e. this giveaway - can only be installed during the giveaway period. @Eva Lee: This special giveaway version does not need a license code, and thus does not come with, a license code. @Gary Smith: Some things on computers, such as some licensing checks performed right after installing this giveaway, "security certificates" - certificates saying that e.g. "Zoner is really Zoner". These certificates are registered in "certificate authorities" - certain widely-trusted certificated warehouses, and computers are in turn told to check those warehouses when checking a certificate. If a given computer isn’t checking an authority that's aware of the certificate it's checking, it will show an error like the one you see. But why specifically this is happening in your case, I cannot say; all I can do is note that this error is a false alarm. @ Martin User: no activation of your ZPS 17 is needed; you already have the full ZPS 17. As you note, no activation is also possible, because activation would require a license code, which is not needed and thus not sent. How to put your program in Russian? Zoner Software @Alex User: This giveaway cannot be used in Russian. Each installer for ZPS installs the program in a certain language. The Giveaway installer installs the program in the English language. Kal El any answer to this? For some reason your earlier comment isn’t showing up when I refresh this comments page. It showed up fine in your link, however. The answer to this is the same as the answer to similar questions above and the same as is implied in the download message: no login or activation is needed, as the BDJ version is pre-activated. No manual activation of this already-automatically-activated version is needed or, indeed, possible. Your PRO version won’t get revoked after a few days. Dale User I've purchased the FREE Zoner Photo Studio 17 PRO 3 times and still haven't received an e-mail with the download link ... Anyone have the link that they can post? Cary Adams @Mr Wonder... My, my... a 'cranky" day. You do know that even the best AV occasionally yield false positives. Since you believe that the download you received is special, and unlike all the others' downloads here, why don't you upload YOUR copy to VirusTotal and see for yourself? By the way, Outpost has its share of woes, and even AV-Comparatives doesn't even consider Outpost as a serious AV contender. But please feel free to ignore this stellar offer. 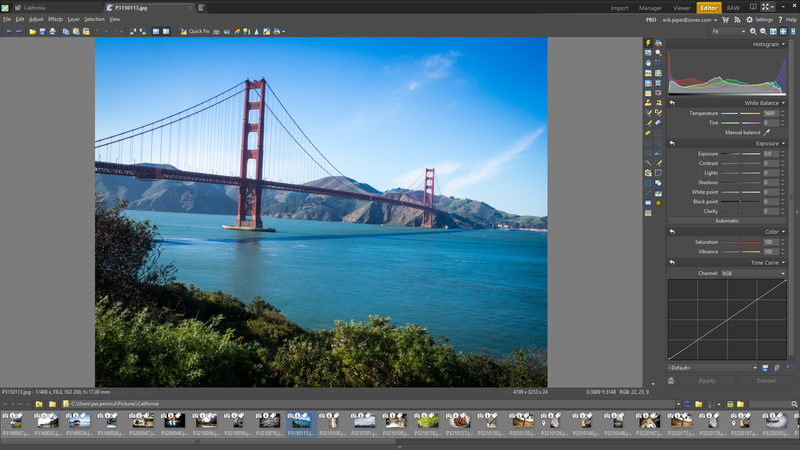 ZPS is hands-down the best affordable esiting and organizing photo software period. ...you know what, you have made your decision, and you also have my apologies, I did not mean to step on anyone's toes, and I won't bother you any more. I wish you the best of luck and have a nice day. I just wondering - in my computer I have Zoner Photo Studio ver. 15. Yesterday I got Zoner Photo Studio 18. Can I uninstall previous version without any distraction of my pictures? Peter Ekkerman @ Mr Wonder, You write: "This chapter has ended " and you're so right, but so has your Outpost software. How good its virus definitions are after the sale - is anybody's guess.. If it is indeed infected, which I doubt - get a new download..
All I can say is that a closed mind is a unenviable state of mind.
" Everybody is wrong except me "
I agree with Dan Amiel - get rid of this software altogether. My vote goes to Cary Adams as well for his description..
Gary Smith @ Mr Wonder, Rather than speculate that your downloaded file is possibly different from others, post what the md5 or sha1 hash value is for your downloaded file so everyone can see. A hash value is commonly used to ensure that what you downloaded is the same as the file on the download site. If you are not familiar with md5 or sha1 has values, the idea is quite simple. You use a program that calculates a "hash" value for a file. One single byte different will result in an entirely different number, meaning that if you have a hash value for a file, then change one byte of the file, and then calculate a new hash value, the two hash values will be drastically different. If you do not have an app to calculate hash values, there are many free ones available. Many will work with the context menu, in that all you have to do is right click on a file, and select the item that will calculate the hash value. I like "Summer Properties" for the simplicity of adding a tab in the File Properties menu. It can calculate md5 and sha1, as well as crc16 and crc32 values. Once you can show what md5 (or sha1) hash values are, you will become the leader in pointing out changes made while downloading files. Then you can more easily investigate what is causing the change. In order for a file to change, there has to be something in between your downloaded file and the file's source file that would change the data before writing it to your download location. Most likely that will be a malware program installed on your computer; it would have to be unique to your computer. If it were on your ISPs end, they surely would have caught it already. Now, if your md5/sha1 value turns out to be the same as the source file, then you should start suspecting that the Outpost Security Pro software that is outdated may not be giving you accurate results. In that case, you might consider investing in better virus protection. Check out the independent tests that show which antivirus programs have not missed a single "in the wild" virus for several years running. Looking forward to your hash value(s). But I'm afraid it's " Casting pearls........"
Gary Smith I do wish Zoner would handle link files (.lnk) correctly. Rather than open the folder a lnk file points to, it looks like it tries to display the lnk file as a folder/file. Other programs have no problem with lnk files, and others attempt to open the lnk file itself. Zoner has had this issue for as long as I have tested it (ver15, 16, 17). I have petitioned software developers to handle lnk files correctly, and they have made corrections, so I hope Zoner will do the same in a future version. If the operating system can use them, why shouldn't the software as well? Can anyone create a shortcut to a folder that contains images, then see how Zoner handles the shortcut? It would be interesting to see if there are cases where this works. Gary Smith @Peter Ekkerman, Guilty as charged; I was already afraid of hinting of a software program, but since so many are free, it shouldn't matter. I didn't even think about adding a link. The link you provided is an excellent list of HASH utils, plus explanations, and samples of the program's output. I urge anyone to check out that resource, especially if you do not already have a good HASH utility. Even if you do, there may some that you have not checked out. I am going to check out two I haven't tried yet. Hopefully in the future, we can have published HASH values for the download files we get here. Regardless, we can always check any claimed alterations. I hope Mr Wonder will at least test the file at virustotal.com. Once it is determined that the file is the same as what the rest of us downloaded, he can test his system out to see what the culprit is. Thanks for your vote :) Yes I thought it was a good start. The article itself is a few years old , but most of the utilities are still available. As for Zoner handling .link files or shortcuts - I found no fault with that. but for folders it shows the folder preview, but will open it when clicked..
@Irina Serebrina: Yep, you can uninstall version 15 safely. @Gary Smith: Hmm. Just tested this now. The clickthrough works as expected for folders when you're doing a classical browse of the filesystem via the "This PC" (or "Computer" or "My Computer" - the wording varies among Windows versions) section of the Manager's left column. It does not when clicking through in the Catalog. It does work as expected (at least for me) for picture shortcuts in all cases. In any case - guilty as charged, at least partially. I will ask what we can do about this in this autumn's version of ZPS (the one after version 18). For now I can advise to stick to your picture folders themselves for the Catalog, rather than cataloging folder with shortcuts to picture folders. Zoner Software @Gary Smith: Just explored this some more while writing up the issue ticket our issue tracker. It turns out there's another condition that has to be fulfilled for the problem to occur. It only occurs when the shortcut's target folder is outside of the Catalog. So besides the workaround of not cataloging folders that contains shortcuts to folders, you can also, instead, use the workaround of cataloging both the folders with the shortcuts and the folders that contain the shortcuts' target folders. Folders folders folders. Folders. I haven't said folders enough, I think. >It only occurs when the shortcut's target folder is outside of the Catalog. I agree; it is only for shortcuts to folders on the Manager's Tab in the Catalog tree. The same shortcut under the others do work as expected. Thanks for getting the issue into the tracking system.